Spinit Casino Review - Are They a Legitimate Casino? Or is it a Scam? Spinit is one of the online casinos that has been around for a short amount of time. It came into existence in 2016 but has quickly garnered a lot of attention and users due to its exciting interface, its focus on including a massive library of games and being licensed by the UK Gambling Commission and Malta Gaming Authority. The site is also eCOGRA certified lending even more credibility to its operations. There are a number of bonuses on offer on the site which come with industry standard wagering requirements but offer a lot many more free spins. The downside is that a lot of slots are excluded from meeting the wagering requirements. Overall, we like Spinit because of its wide breadth of games and its rock-solid reputation for safety. The Malta Gaming Authority is responsible for monitoring Spinit and ensuring that they have the latest security measures in pace. The site also uses SSL encryption to keep user information safe and has made its payments page PCI compliant to keep the credit card details of players as safe as possible. Detailed in our summary on the right hand column, Spinit offers a pretty good range of banking options however they have yet to allow for Bitcoin. The minimum deposit is $10 and the maximum is $5000, while the withdrawal cap is set at $5000 per week and a maximum of $22,000 per month. Spinit offers the standard options for customer support like Live Chat, Email support, as well as phone number. We found the Live Chat service to be down every time we tried and the best option seems to be using the Email method. An exhaustive FAQ section is also available on the site which provides a lot of information but is not the easiest to navigate because of the numerous drop-down menus. 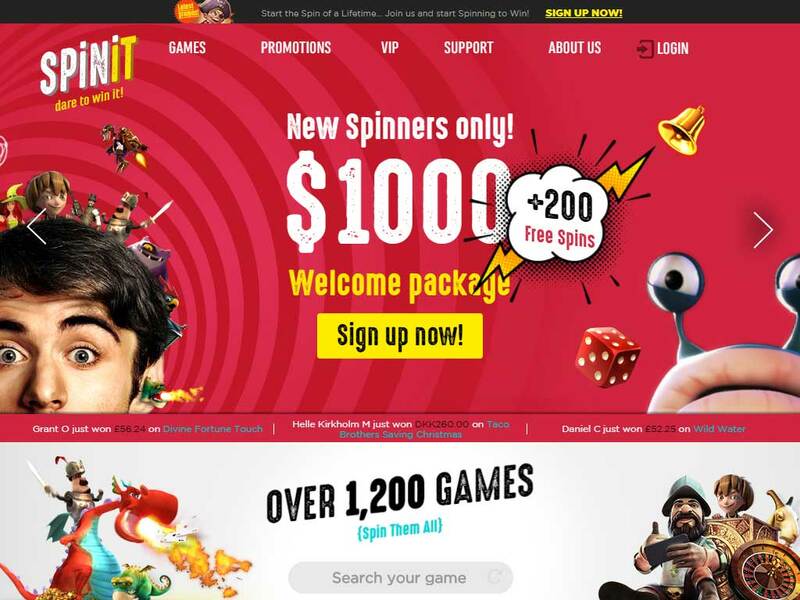 Spinit are currently offering a $1,000 + 200 free spins welcome package. This is not actually one big bonus, it is separated over 4 deposits (which is a common marketing strategy by casinos to make it look bigger than it is). The first deposit gives a 100% match bonus up to $200 + 200 free spins, the second 50% match bonus up to $200, and the remaining two a 25% match bonus up to $300. There is a 40x times wagering requirement before the bonus money can be cashed out. For example, if you receive a $100 match bonus then you must wager $4000 before the reward can be withdrawn. There are a few other promotions that Spinit if offering on its site including the long-running Monday Reload bonus of 25% on deposits worth up to $100 and the Spinner Choice promo which offers the players a free spin on a new game every Wednesday. The bonuses that Spinit is offering are pretty average for the industry and you can definitely find some better offers on other competing casinos by looking a little harder. Hopefully, this is a just a temporary glitch and should be resolved soon to allow players the best possible mobile gaming experience. Spinit is a reputable casino which has enhanced its reputation by being licensed and approved by some of the strictest online gaming commissions. The casino is also eCOGRA approved to put the player’s mind to rest about the fairness of the games being played. If you are a player that enjoys having a wide selection of games available then this is the site for you. If you are looking for a site that offers bumper bonuses then you can look elsewhere.